Author: de Lint, Charles Set In . . . Description: When Celtic folk musician Janey Little discovers a secret manuscript in an old attic trunk, strange and frightening things begin to happen. Janey’s perilous story, and the one she is reading—about spunky adolescent Jodi Shepherd, beset by the witchery of the evil Widow Pender—expertly weave two separate plot threads. A steadily mounting tension makes two small seaside villages in Cornwall come alive with danger, magic, and mystery. 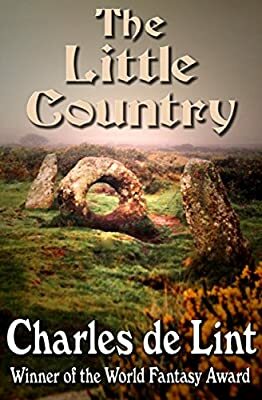 One of de Lint’s best-loved novels, The Little Country is a fantastic escape dealing with ancient standing stones, the power of music, and the warmth of true friendship. “What a great, galloping wonder of a book—deep and wide and witty and wise. And absolutely impossible to put down. Charles de Lint's masterwork, The Little Country, must stand as the finest novel of fantasy in 1990. Charles de Lint is the best of the post-King fantasists, the one with the clearest vision of the possibilities of magic in a modern setting. …in The Little Country he never goes over the edge into preciousness or self-indulgence. This book sings. What I like most about de Lint's work (and in particular The Little Country) is his talent for making ordinary settings like Cornwall or downtown Ottawa come alive. After reading de Lint, I start hearing music down side streets, and revel in rooting through a second-hand bookstore. De Lint makes us appreciate the beauty of what we have. In a genre choking to death on regurgitated Tolkien, de Lint does research and imbues his story with an unusual, authentic atmosphere. In a genre of elaborately mapped Neverlands, de Lint sets his tale in our contemporary world and makes it not less magical. And in a genre plagued by automatons acting out Joseph Campbell's theories, de Lint develops complex characters and original plots. This is the book that cemented my love for the urban fantasy genre and, in particular, my love for Charles de Lint. This man is a master storyteller, who infuses his stories with lifelike characters, evocative settings, and a sense of wonder that I think is sometimes too often missing in a lot of fantasy. De Lint weaves the story within a story wonderfully. He can also juggle a huge cast of characters and their multiple viewpoints with real aplomb. And while there’s always action happening, he knows exactly when to pull back and allow for some quiet moments. But when the climax comes—and it happens at the same time in both stories—the tension really ratchets up. I loved that music was a huge part of everyone’s life, whether it be playing music, listening to it, or singing it. The inherent magic in music is a theme de Lint uses often, and it’s one of my favorites. And I am fairly certain I would not be the lover of Celtic music that I am if it weren’t for Janey and company. And, this being a romance blog, I have to mention that the second time around love story between Janey and Felix, a sailor she’s known for years, is among my top romances ever as it’s very poignant and well done.